When England's women made history in Canada this month, they provided a launchpad from which to fire women's and girls' football to a whole new level. The Lionesses won the bronze medal at the 2015 FIFA Women's World Cup, the best ever performance by an England team and the first time any England senior team has made a World Cup semi-final since 1990. World Cup fever swept the nation, with millions of late night viewers heartbroken by Laura Bassett's cruel injury time semi-final own goal, before celebrating bronze medal success with a first ever win over Germany. Women's football made front and back page news like never before, BBC television covered every game live and people who had never watched women's football before were talking about Fara Williams' set pieces and her coolness from 12 yards, Lucy Bronze's screamer against Norway, Jade Moore patrolling midfield and Bassett and captain Steph Houghton locking things down at the back. It is not easy to capture the nation's attention, particularly when playing at midnight, but the Lionesses managed to do just that and, in doing so, provided the platform for women's football to build and develop like never before. Rachel Pavlou, the FA’s national development manager for women’s football, was naturally delighted with how the World Cup was received and the implications for the game moving forward. "It was such a fantastic tournament for so many reasons," said Pavlou. "Winning the bronze medal, the nation falling in love with the Lionesses, the superb BBC coverage of every game and more than two million fans staying up to cheer England on. "We’ve also seen it give a real boost to the wider areas of women’s football and with a noticeable uplift in enquiries from new players, potential volunteers and fans." Pavlou, who before the tournament described Team GB's win over Brazil at the London 2012 Olympics as a "defining moment" for the game, is certain that there is now another one to build on. "We definitely have another defining moment now: a bronze medal in the World Cup, beating Germany after 21 times of trying... and on a penalty! "It was so amazing that all the players lifted themselves after the pain of Japan and played so brilliantly to get that medal. It’s now up to everyone working in women’s football to build a legacy following the World Cup." So how to build that legacy? A lot of work across all levels of the game, for starters, and Pavlou said she and her colleagues at the FA have been "brilliantly busy" trying to "capitalise on the momentum" of the Word Cup. The same can be said for the England players who, despite earning some time on the beach after their exploits in Canada, were back playing for their clubs less than a week after flying home, conscious of the need to convert World Cup fever into more interest in the Women's Super League. The first weekend back for the WSL saw attendances up 78% on the first half of the season, with Manchester City's 1-0 win over Birmingham City Ladies attracting a league record crowd of 2,102. Overall, WSL attendances have grown by 42% since this time last year and the World Cup effect should see that increase grow through the second half of the season. Indeed, a poll of Club Website members found that 48% were more likely to go and watch women's football as a result of the World Cup (15% less likely, 37% the same). Affordable and accessible WSL tickets mean that fans will have plenty of chances to watch their World Cup heroes before the Lionesses' take on Bosnia & Herzogovinia in Bristol on 29 November - their first post-World Cup outing - whilst this weekend's Women's FA Cup Final provides the chance to see some of them on this country's biggest footballing stage. Saturday's final between Chelsea and Notts County will make history as the first Women's FA Cup Final to be played at Wembley Stadium and, with 27,000 tickets sold already, a record crowd is guaranteed, eclipsing the 24,582 who watched Arsenal beat Leeds in the 2008 final. As they did for the World Cup, the BBC will be at covering the final across TV, radio and online and the woman back at the helm, Jacqui Oatley, hopes that lots of new women's football fans will be tuning in or, better still, turning up at Wembley for the game. "For me, the best feedback we got at the World Cup was from those people who'd never watched a women's tournament before and didn't expect to be drawn into it in the way they were," said Oatley. "They got absorbed in it almost by accident and now they are fully engaged; they know who the players are and who the characters are and have a better idea of the WSL teams. The next step now is for those people to go out and watch matches. That really is key. "It's all very nice that people watch the games on television but women's football has to become a spectator sport that people pay to watch if it is to be sustainable in this country." The BBC's Women's Football Show presenter believes that marketing of the women's game needs to improve substantially, from both the FA and the WSL clubs and aided by the players themselves, many of whom have tens of thousands of social media followers. She concedes that coverage of the game could also improve, particularly in newspapers, but thinks that people who complain about lack of coverage could also do their part by attending WSL games themselves and bringing family and friends along. "People really need to think 'well, if I enjoyed watching it on television, what it will be like in the flesh?'" adds Oatley. "It's such a good family day out and it's cheap as chips in comparison to Premier League football. "I don't think people realise it's only about five or six pounds for an adult on average, half of that for a kid, or you can get family deals for a ten or twelve quid, depending on where you go." Tickets for this weekend's Wembley showpiece - available at ticketing.thefa.com - cost £15 for adults, £5 for children and £30 for a family of four, which gives fans the chance to support the women's game and take in a Wembley cup final at a fraction of the normal price. But whilst making history at Wembley Stadium will help grow the game at the elite end of spectrum, the challenge of building a legacy for women's football also involves vital work at grassroots level. 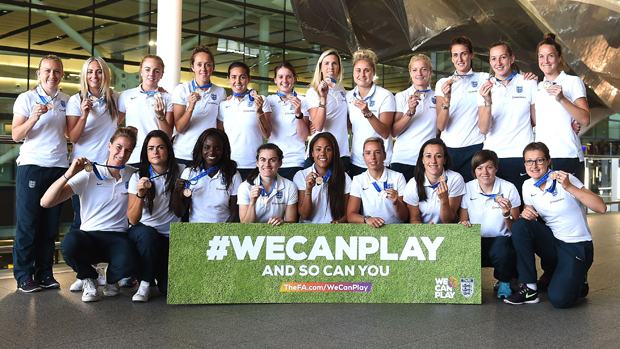 In their 2012 women's football strategy, Game Changer, the FA set themselves the bold target of making women's football the second largest team sport in England, after men’s football. There are more women and girls playing football today than ever before but, as Pavlou told Club Website before the World Cup, one of the FA's biggest challenges is to change perceptions of the women's game, particularly in parents of girls who still see football as a boys' game. 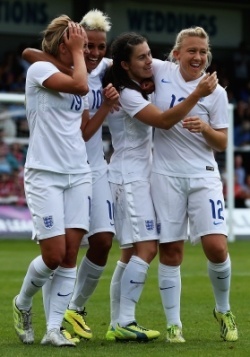 To that end, the Lionesses' performance in Canada can only have helped. "The performance in the World Cup demonstrates to every young girl that they can play the nation’s favourite game," said Pavlou. "We launched our girls’ participation campaign ‘We Can Play’ at the start of the tournament and we have had so much support from both the public and media encouraging girls to play. "Our County FAs have been inundated [since the World Cup], busy signposting females of all ages to both affiliated and recreational opportunities. We have also had a lot of interest in our free girls’ only FA Skills sessions that will take place over the summer holidays. "Most of the national girls’ festivals we have run during and since the World Cup have had a waiting list of participants, such is the interest, and many of the Community Trusts in the 90 men’s professional clubs have seen an uplift in queries to join their participation sessions." These positive noises coming from the FA are supported by anecdotal evidence from Club Website members, who we asked on social media about any apparent increase in interest in girls' football on the back of the World Cup. Nigel McAdam of Denton Girls in east Manchester had a similar story to tell. There is certainly a positive feeling within the grassroots community about the future of the female game - 74% of Club Website members believe the World Cup will provide a "lasting boost" to the game at grassroots level" - so this is opportunity the FA must seize to build that legacy for women's football. Rachel Pavlou is confident that the World Cup effect and recent FA initiatives - with 'We Can Play' leading the charge - will see participation levels increase in female grassroots football. She points to increased funding for the female game and the continued work of the Community Trusts and County FAs, supported by clubs, schools and other partners, as reasons to be optimistic, but is also excited to hear the same message coming from the very top of the organisation. "Martin Glenn, our new CEO, has stated that accelerating grassroots girls’ football participation will be a priority for our association and wants to bring all our key partners with us, so we are very excited about the opportunities going forward," said Pavlou. "It’s a brilliant time to be a part of women’s football." Tickets for the Women's FA Cup Final are available now at ticketing.thefa.com. Find out more about the Women's Super League and buy tickets online at fawsl.com. England team photos courtesy of TheFA.com.